Rapid urbanization has led to an increase in the over dependence on cars as people endeavour to enhance their mobility and meet their travel needs. Strategies have been developed to avert the negative impacts of this phenomenon that focus behavioural changes such as reducing travel by combining trips and changing travel destinations and also modal shift which involves shifting to less polluting modes like cycling, walking and mass transit or public transportation. Literature has shown that as an incentive to public transportation use it is important that infrastructure that enables people to access the system with ease is in place for instance having the platforms within easy reach, having sufficient parking facilities at the stops and having real-time information displays that would give users the accurate time on what time to expect the next mode. 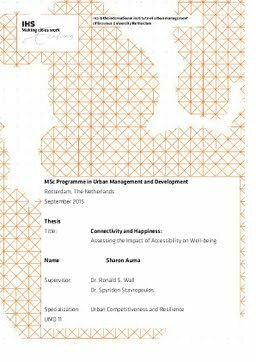 This thesis aims at explaining how improved connectivity as a result of better accessibility would enhance the wellbeing of people. Wellbeing or happiness is a focal point in this study because recent literature on happiness economics has revealed that it would be important to evaluate the impact of projects not only basing on the economic benefits but also on the impact they have on people given the fact that they are the eventual users. Innovations in transportation could affect the wellbeing of people positively by enabling them to meet the travel needs and negatively by exposing them pollution and traffic safety concerns. The study use data from the Municipality on the quality of life spatial indicators from the Rotterdam gebeidprofiel (Rotterdam Area Profile (2008-2012)) and the information on happiness from the Rotterdam Leisure Survey (2009). Demographic information was accessed from the website of Statistics Netherlands which is the Dutch central bureau of statistics while time schedules and travel patterns of modes was accessed from the Rotterdamse Elektrische Tram (RET) website. Interviews were also conducted and these targeted the Municipality and RET personnel especially those involved in the transport and planning sector. The analysis is performed using the ordered probit model and it focuses on the causal relationship between accessibility and happiness, accessibility is measure in terms of distance from public transportation stops to determine the ease of accessing transportation, frequency to determine efficiency and this is analysed by considering the number of mode visits, the waiting time at the stations and the time spent in the modes The number and type of nodes is used to determine the choice available for users. The study also includes an analysis on the impact of income on travel behaviour and mode choice. The study reveals that proximity to nodes despite the accessibility benefits would reduce the happiness of neighbourhoods as it heightens concerns on noise pollution and traffic safety. Increased number of nodes also negatively affects happiness as does the increased number of directions that the modes go through. Increased number of mode visits reduces happiness as it would lead to congestion, increased waiting time also negatively affects happiness as people attach value on travel time which incorporates both waiting time and in-vehicle time. Overall it is recommended that measures be developed to be mitigate the negative impacts of overall accessibility such as having buffers at the stops to shield people from excessive noise levels and ensure effective use of public transportation. It is also important especially for the neighbourhoods categorised as very unhappy that access to public transportation is improved in terms of reducing the distance from the homes to the nodes, increasing frequency modes and also increasing the number of directions accessible to them as all these indicators are positive for the happiness of this category.